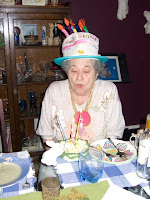 It Figures...: Mom turns 87!! 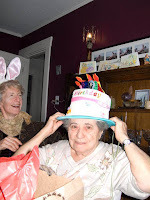 Mom's 87th birthday was Monday, April 9. She came over for dinner on Sunday and here are a few photos of her and her partner-in-crime, Norma. 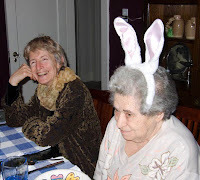 The first has her in bunny ears (it was also Easter). And then had her blow out some candles. My mom will be 87 in August. Scares the heck out of me, though. Good idea, the party. Think i'll plan on the same. Tell "Mom" she looks good for her age. Mine still drives, and does all of the shopping for herself Goodluck to you, and "Mom"
Mom is pretty amazing. She gave up driving when she moved from New Jersey to Seattle (at age 84) and takes the bus all around town. I sometimes can't keep up with her!